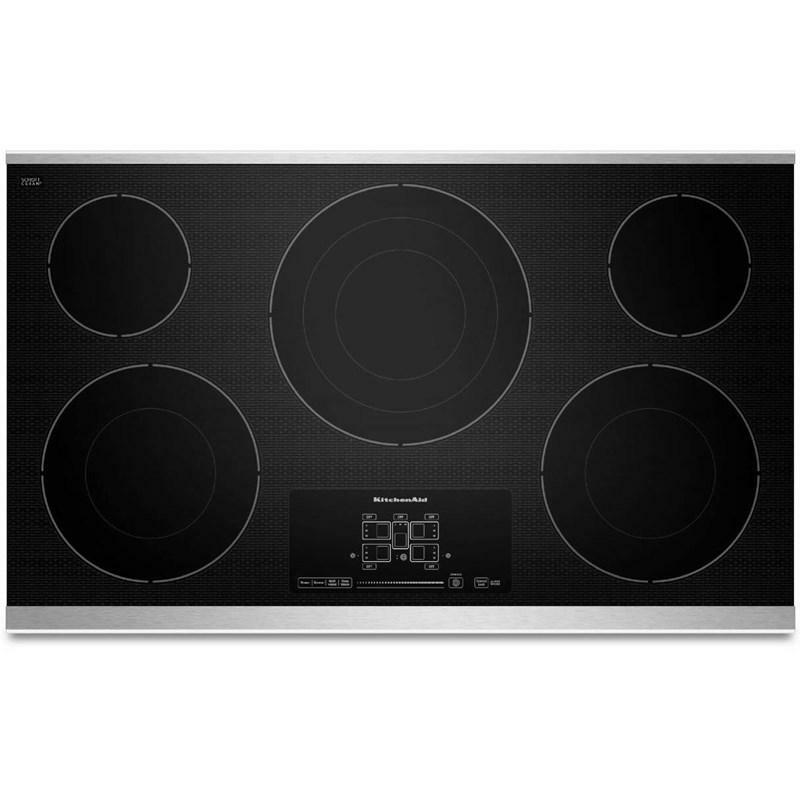 This KitchenAid 36" 5-element electric cooktop with Even-Heat™ technology features triple and double-ring elements to closely match cookware size to power needs, touch-activated electronic controls which use intuitive technology and enhance the clean styling of the ceramic glass, and a Keep Warm setting that keeps power at a level that won't exceed 100 watts. Power Output Left Front Element: 2,500/1,200 Watts; Left Rear Element : 1,200 Watts; Center Rear Element: 3,000/1,950/1,050 Watts; Right Front Element: 2,500/1,200 Watts; Right Rear Element: 1,200 Watts. Burner/Element Size Left Front Element: 10"/6"; Left Rear Element : 6"; Center Rear Element: 12"/9"/6"; Right Front Element: 10"/6"; Right Rear Element: 6". Additional Information Even-Heat™ Technology helps avoid hot and cool spots by delivering consistent heat across the entire element; Even-Heat™ Simmer settings help take the guesswork out of finding the perfect simmer level; Even-Heat™ Melt settings help maintain the low temperature needed to melt without scorching; Triple- and double-ring elements give you the versatility to closely match cookware size to power needs; Touch-activated electronic controls use intuitive technology and enhance the clean styling of the ceramic glass; Keep Warm setting keeps power at a level that won't exceed 100 watts, allowing you to keep cooked food warm; Premium ceramic-glass surface includes a subtle watermark and wipes clean easily to maintain a stylish appearance.